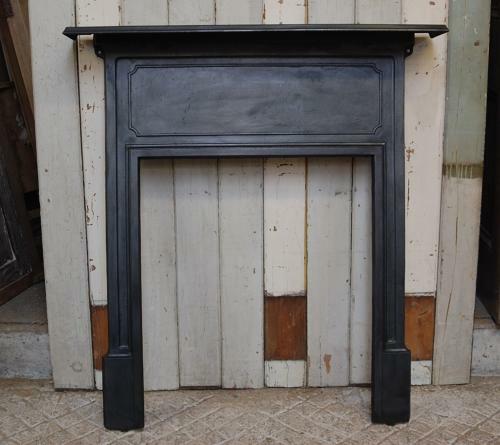 A plain, classic style, Edwardian cast iron fire surround suitable for pairing with a wood burner or fire basket, dating to approximately 1920-1925. The surround is of a compact size and would suit a smaller reception room or bedroom. The fire has been stripped, blacked and polished and has an attractive finish. The fire has a simple design with a moulded detail under the mantel and down the legs. The fire has fixing lugs on the sides and at the back of the mantel. The fire is antique and therefore has some slight signs of wear due to age. There are some casting marks on the cross bar, scratches and light knocks, please see pictures for details. The back has surface rust as expected. The fire has a classic, period look, that would suit both modern and older properties and would finish a fireplace beautifully.